Molly Shortridge studied flute performance and music therapy at Temple University’s Esther Boyer College of Music and Dance. Her most notable teachers were David Cramer (associate principal of the Philadelphia Orchestra) and post-college, concert-soloist, Clifford Tretick , with whom she studied flute extensively. Molly also studied pedagogy under the award-winning Kathy Blocki, and completed the KinderFlute training program to become a certified KinderFlute teacher. 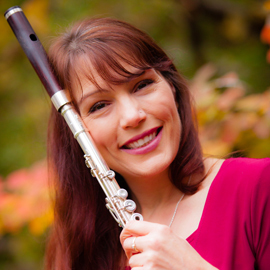 She has presented flute pedagogy workshops at The National Flute Conventions in San Diego and Orlando, as well as at the Mid Atlantic Flute Conference in Reston, Virginia. She also has studied counseling in a graduate program at Messiah College. Upon graduating from Temple, Molly was a music therapist in the adult mental health field, while continuing to teach flute and perform. Currently, Molly is passionate about her studio teaching and teaches full time. She maintains a studio of 50-60 students, develops ensembles and classes, teaches flute workshops in area schools, teaches district band workshops, and flute fundamental workshops. She also has developed flute camps and flute ensembles. Molly’s students regularly win auditions in the PMEA district, regional and state band/orchestra ensembles and in the Harrisburg Youth Symphony Orchestra. Many students major in flute performance, education and composition in colleges and conservatories, and one that auditioned successfully to be part of the U.S. Marine Band directly out of high school. Several won the Harrisburg Youth Symphony’s Concerto Competition, and were also finalists in national competitions. Molly is the business owner of The Fluteplace of Central PA, L.L.C., She is a dealer of flutes, music, flute-art, and flute accessories. Her business offers flute repair services and flute instruction. Her very successful program Kinderflute-Academy and Kinderflute Academy on Facebook as been in operation for over 5 years, where she has successfully started children as young as four on the flute. She is Flute Instructor at State Street Academy of Music in Harrisburg, Mechanicisburg High School, The Perfect 5th Musical Arts Center (where she is also a Co-owner), and The Pollock Center in Camphill. She also was an adjunct flute instructor for the Blue Mountain Chamber Music Festival. Molly has performed from a young age both professionally and as an audition winner in various organizations. She often successfully auditioned for first chair in district band, and was selected for regional bands and orchestras. She was first chair in Harrisburg Youth Symphony, and was one of two chosen from Pennsylvania to participate in the American High School Flute Choir in New York City. She also was a Harrisburg Wednesday Club scholarship winner. Molly regularly free-lances in this area and has played in the Central Pennsylvania Oratorio Orchestra, The Harrisburg Choral Society Orchestra, Hershey Theater Orchestra, The Hershey Symphony, flute quartets, pit orchestras, the Carlisle Musical Arts Club, and several other chamber and choral ensembles in the greater Harrisburg region. She plays with small ensembles and/or as a soloist to accompany musicians in concerts, such as the recent local concert with Grammy-nominated violinist, Jenny Oaks Baker. In 2012, she toured Central Italy with The Market Square Singers, led by Eric Riley, and performed solos in a series of concerts in Central Italy. 1) Accountability: Private lessons with a teacher provide accountability and make students want to prepare their lessons and improve. 2) Goal setting: Private lessons allow a student to know which goals need to be set and help the student learn how to practice, improve listening skills, reduce tension, improve sound, become more musical, improve confidence in playing, develop vibrato, read music, an improve many more aspects of playing the flute. Setting goals with each student and working on the goals one at a time has proven to be effective in helping each student achieve the level of playing that they desire. The relationship between the student and the teacher must be a positive one. Gentle encouragement is usually all that is needed. With young children, tangible prizes such as ribbons or treasure-chest toys are used as rewards. Verbal discussion also is helpful in exploring ways to work on individual goals and also explore reasons why a student may not be reaching the goals that they set. 3) Methods and Exercises: Method books and flute repertoire are selected to provide optimum learning. Molly designs activities and exercises that are intended to help the student grow and learn in a way that is fun and engaging. Recognizing that everyone learns at his or her own pace, Molly is able to adapt methods to suit differences in each student, regardless of age or abilities. While fundamental exercises are highly important in lessons, Molly provides these with a balance of beautiful and interesting repertoire so that each student can gain joy from playing music. New literature, methods and repertoire are frequently explored to keep teaching fresh and provide optimum understanding of the nuances and limitations of the instrument Molly has also been successful in teaching students that have attention deficit disorders, autism, and cognitive impairments. 4) Experimentation and Feedback: Lessons provide the feedback needed that a student might not otherwise have when playing alone. Students who understand that learning an instrument involves experimentation and feedback and are willing to purposefully alter their stances and technique do well. Having been a music therapist and also having studied counseling in graduate school, Molly has developed high levels of observation skills that allow her to offer constructive feedback all many aspects of playing the instrument. Relaxation skills, breathing techniques, and dealing with stress and anxiety when performing are also frequently covered in lessons. 5) Modeling: Students learn by listening to the teacher play the flute and emulating sounds and expression. Often, many flute students have never heard a professional flutist play, live or recorded. Experiencing music played by the teacher in classes and lessons is sometimes the motivation needed to encourage the student to become a better flute player. 6) Quality of the instrument does matter: Recognizing that optimum learning occurs more frequently on high quality instruments, Molly is able to provide her students with expertise on which instruments to buy within each person’s price range. Lessons can be set up to help a student choose between instruments, as well. Molly regularly checks each student’s flute to determine if repairs are needed, and hand delivers the flute to her flute technician for quick and high-quality repairs. Instruments are also available to purchase or rent through her technician or through her own business. Advise is also given as to what models can be problematic, as well.